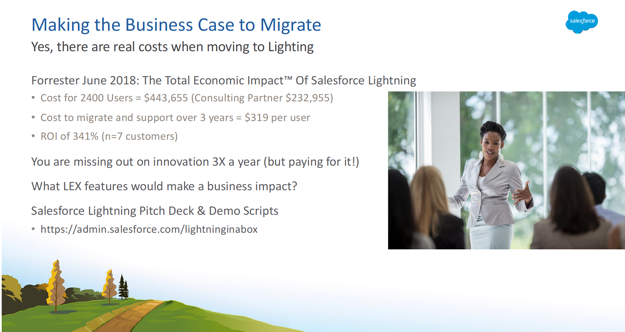 How much does migrating to the Salesforce Lightning Experience cost? What’s the ROI? What’s the big driver of expense and project time – number of users or org complexity? 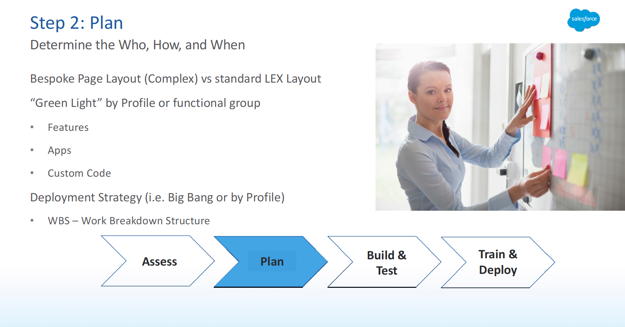 This presentation covers migration tools, tips, best practices, as well as the hurdles you’ll experience when transitioning to LEX from Classic. 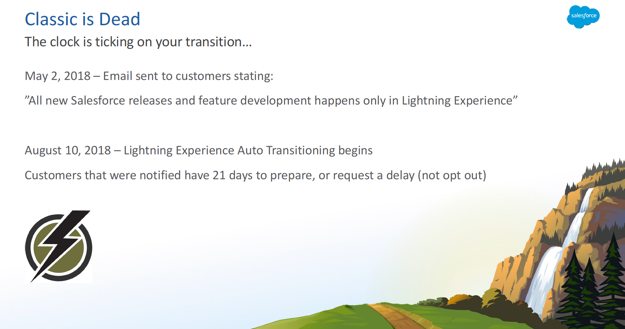 NOTE: Salesforce will turn on Lightning Experience on a rolling basis starting in Winter ’20 (i.e. auto-activating) – don’t get caught unprepared! 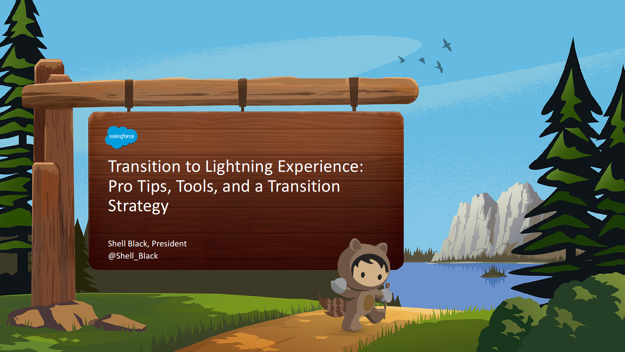 For the next 40 minutes I’m going to take you through this session, Transition to Lightning Experience (LEX): Pro Tips, Tools and a Transition Strategy. But first, I must tell you about the forward-looking statement slide, I’m sure you’ve seen this about a dozen times so far. It is on Salesforce’s website. Essentially, make all your purchasing decisions based on current functionality and nothing that I say here. Make sense? You guys ready to jump into this? I got one slide to introduce myself. So, as Kevin said, Shell Black. I’m a Salesforce MVP, I’m one of about 220 worldwide. I’ve been an MVP now for about six years, part of that group. 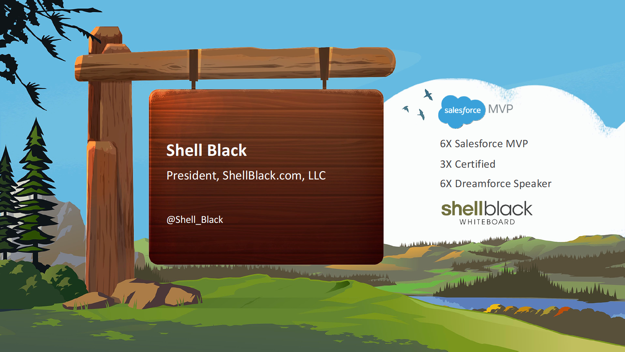 I’ve got three certifications, this is my sixth year in a row speaking at Dreamforce. Thank you for keeping me coming back, I love that. I also have a YouTube channel called "ShellBlack Whiteboard" – anybody seen one of my whiteboard videos? Nice, nice. If you don’t know what that is, there’s about 30 videos out there, I explain a lot of core concepts. 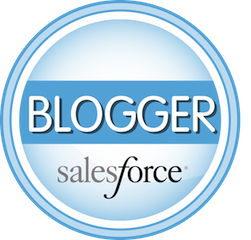 Tips, tricks, best practices, how to get the most out of Salesforce. It’s had a little over 1.5 million minutes watched, which is pretty good considering they are no cat videos up there, so that’s pretty good. If you want to follow me on Twitter, @Shell_Black. I have one slide on my company. I started ShellBlack.com back in 2010, so this is our eighth year as a company. 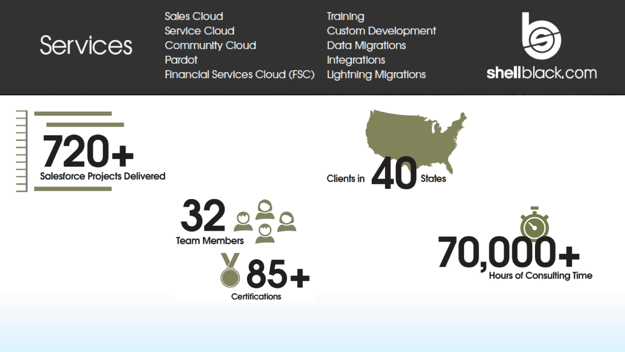 Some of the services we provide are at the top, Financial Services Cloud (FSC), migrating to Lightning. We’ve been pretty fortunate, we’ve got clients now in 40 states, we’ve delivered over 700 projects, we’re about a 30-person firm. So, if you need help with Salesforce, or Pardot, please let us know. All right. I want to really get into this and lay a couple of things on the table and just get it out in the open. Classic is dead. It’s not coming back folks, I hate to tell you. So, if you’ve been with us for a while in this Salesforce ecosystem, Lightning has been out three years. It came out August, 2015. And if you’ve been watching the release notes, the number of Classic-only features has been on a steady decline. There’s a lot of people in the community that’s had it on a death watch. And if you looked at the release notes, the number of Lightning-only features has been increasing. The first evidence that I found that it was officially dead is there was an email that was sent out to customers on May 2nd, and they didn’t bold-face it, they didn’t really call it out, it was pretty subtle, but they said, "All new Salesforce releases and future development happens only in the Lightning experience." Here on out, you’re not seeing Classic on demos, you’re not seeing it on the website, you’re not seeing Classic here at Dreamforce, right? 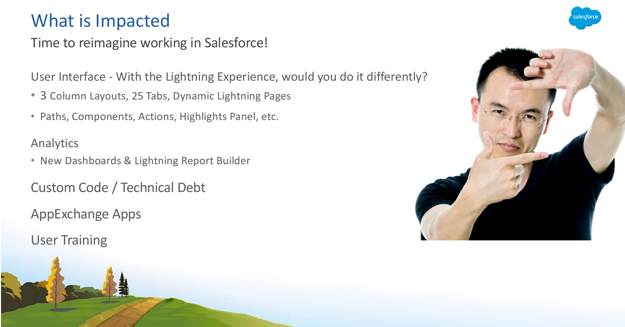 I like to call Classic the 2015 version of Salesforce, because that’s when Lightning came out. The next question that always pops up is, "Well, so how long do I have before we have to move to Lightning?" Well that’s already happening. A group of customers on August 10th got an email, said, "You’ve got 21 days to get ready to move to Lightning and we are turning it on for your company." Anybody get that email? A couple of you guys did, right? And then you got the little countdown clicker in your org saying how many days left you had? That’s pretty shocking. We had two of our clients get that email that said that Salesforce is going to auto-enable it, just turn it on for all the users. Interesting enough, those two clients both were using some features that were only available in Classic, one was using Mail-Merge and one was using Printable View, and they still got the email. I’m not sure how you get into that bucket, but it is happening. So hopefully you’re here to get ahead of it. Interesting enough, on that email, there was no opt-out. You could follow link, you could fill out a form and make your plea to have it delayed, but not opt-out. So, all those companies that had that email are now in Lightning. Let’s get something else out on the table. Migrating to Lightning costs money. There’s a Forrester report, and I put it in the Chatter feed of this session, so you can go download it and take a look at it. But there’s a Forrester report that came out in June, 2018 called "The Total Economic Impact of Salesforce Lightning." And it cited a company with 2,400 users, and the cost to migrate to Lightning was $443,000. Half of that was spent with a consulting partner, like our company, but $232,000 of that was with a consulting partner. What you really need to take away from that is half of that was internal cost. You’re probably thinking, "Well, what would that be?" Well, this is really the opportunity cost. If you’re migrating to Lightning, that means there’s other initiatives that you’re not doing in Salesforce that could be having a financial impact to your company. It could be we’re buying a new product, maybe Communities, or Pardot, or Marketing Cloud, we want to roll that out. Maybe you have some more departments that you want to roll onto Salesforce. Maybe there’s an AppExchange App you need to deploy, maybe you’ve got your developers working on some code to help your users. If you migrate to Lightning, you’ve got to pause that to work on the migration. So that’s the internal cost, there is a cost to this. They did cite a per-user cost over three years for initial implementation and support of $319 per user. I will tell you, and you will see during this presentation, user count is not the big lever of cost. It’s org complexity. So, I’ll give you another data point. We migrated a customer here in San Francisco, 185 users, little over $80,000. So, it’s not a per-user basis, it’s org complexity, and we’re gonna talk about those things you’ve gotta tackle. So, how do you make the business case for this? Oh, I’m sorry. Let’s talk about their ROI number. There’s an ROI number of 341% that was cited by Forrester. Who does not want 341% return on investment? I know I do. If you go look, well, that was a great number, and of course Salesforce thought it was a good number and immediately sent out a press release. 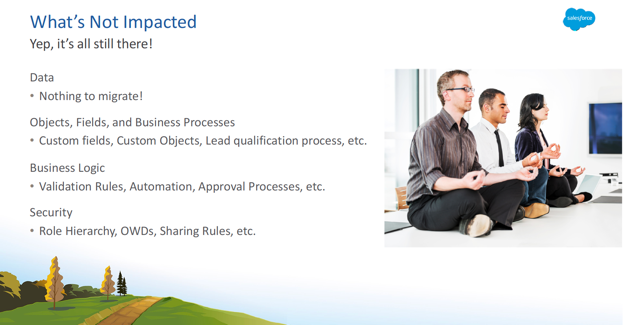 And you’ll see that 341 number cited in a lot of marketing materials from Salesforce. Go look at the Forrester report, in case you wanted to know, that ROI is based on a sample size of seven customers. All I’m saying is your mileage may vary. So, how do you sell this to your company? How do you make this decision that this is what you want your resources to do? We just talked about it – Classic is dead. You’re paying, with your licenses, you’re paying for innovation three times a year. All this innovation that we’re learning about here at Dreamforce this week, you will not be able to take advantage of, well, the majority of it, if you stay on Classic. Because it’s not getting any more innovation, right? We just talked about that. Where the 341 number comes in if you deep-dive into that Forrester report, it’s really what is the benefit to your organization in terms of revenue, efficiencies, better processes that Lightning can give you, that’s going to give your company ROI. You have to go look at that to help make that case. We promised you tools, we give you tools. 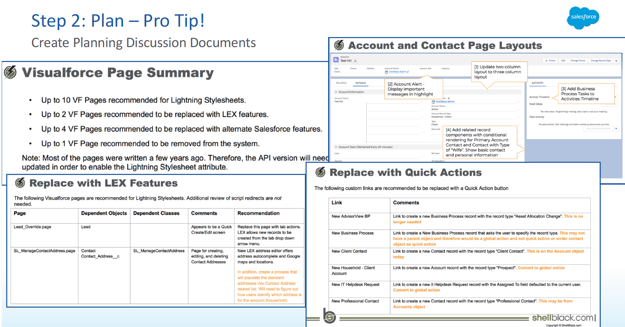 Salesforce does have a demo, or pitch deck, that they’ve put together. It’s at admin.salesforce.com/lightninginabox. And it’s got demo scripts, it’s got how to set up your org, and a pitch deck on how to communicate the value of Lightning to your organization to help you internally sell it. So that’s available. All right, so we’ve gotten that on the table. So what people want to know is, "Okay, Lightning can touch a lot of things, what’s involved, what’s not involved?" And I have two slides to help quickly summarize what’s really involved with a Lightning migration. The first thing is, I think the easier way to have that conversation is, what’s not involved? Even thought it’s called a Lightning migration, or if you’re from Salesforce marketing, the "Lightning transition," data is not involved, there is no migrating data, it’s still there. You’re not going to get really good at the Data Loader and start moving records all over the place – data stays there. The data model that you have – standard objects, custom objects, custom fields, your business processes around leads, sales, customer service – still there. All the business logic, validation rules, triggers, workflow rules, flow, process builder, approval processes – still there. Lastly, security, who can see what and do what? So organizational-wide defaults (OWDs), role hierarchy, permission sets, custom profiles – still there. Don’t panic. Breathe in, breathe out, stay calm. All still there. Let’s talk about what is impacted, and this is going to be the work that we have to tackle. The big value of Lightning in my mind, the number one, is the new UI, right? New user interface. And if you think about Classic, our options were pretty small, right? Or pretty limited. You have a two-column layout, and you have related lists at the bottom – get really good at scrolling up and down, right? That’s the Classic look and feel. So, I wouldn’t say the gloves are off, but you almost need to look at Lightning as if you’re moving to a brand new CRM and think about if you’re going to solve for this by moving to a new CRM, how would you go back to your business processes and your users and think about, "How would I solve this differently if I had a new tool kit?" Right? We don’t have to have a two-column layout, we can have a three-column layout. You don’t have a bunch of information below the fold where you want to scroll? We can have tabs. We can have global actions, the highlight panel, paths, Lightning components. There’s a lot of flexibility, a lot of power. And the whole idea is to make that data more actionable and easier for your users. Other things that are impacted. Analytics, new dashboards, right? So instead of having a two-column or a three-column layout, I think it’s a 9×9 grid. Now we can have a dashboard metric that spans three columns, or spans the whole page I should say. Custom code and technical debt. And I will use custom code and technical debt interchangeably, so if you hear me say that, it’s the same thing. But if you’ve been writing code in your org, that will need to be reviewed to make sure it’s Lightning-compatible, we’ll talk about that here in a little bit. AppExchange apps. If you installed an AppExchange app pre-Lightning, it’s not going to be Lightning-compatible unless you’ve upgraded that to a Lightning-ready version. We’ll talk about that as some of the work that you need to look at. And lastly, user training. I’ve got a whole slide on that, but the idea here is, if you just cut your users into the wild with Lightning and set them free, as soon as they find that "Switch Back to Classic," they’re out of there, I guarantee you. They’re heading to the hills. They’re going back to what looks like home. So, this is what’s impacted. That’s a lot. What’s the process of eating the elephant, of working through all this work in your organization? So what we’ve done was put a four-step framework together – a four-step process. And this framework will expand and contract whether you are a single group of sales users on Professional Edition, or you’re an enterprise customer. The amount of time and the amount of work will be different obviously, but this will expand and contract. It applies to really kind of any size org. 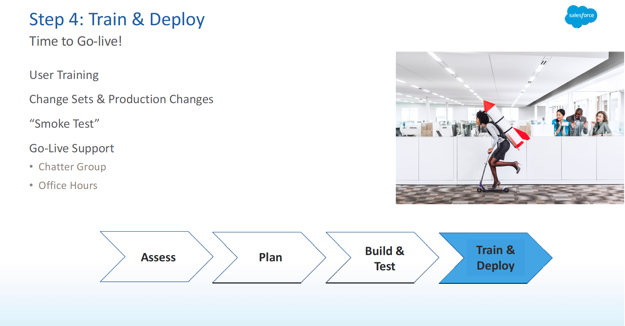 It’s a four-step process: Assess, Plan, Build and Test, Train and Deploy. And with that, let’s get into the first step. So, the first step is really taking an inventory of what is actually in your org. And this may be an important exercise for you if you’re an admin that inherited somebody else’s work, right? You don’t know what’s in there, and it’s always fun to find out something’s in there. We promised you tools, we give you tools. Salesforce makes it fairly easy, there’s a couple of reports and utilities that you can run to get an inventory of what’s actually in there. The first one’s the Lightning Experience Readiness Assessment report. It looks at 25 different features to see if that is available in Lightning, and if you have any compatibility issues between Classic features and Lightning features. With that, they have now wrapped in a Lightning Experience Visualforce Check, and that’s gonna tell you if you’ve got potential code issues. This is not a Lightning-specific report, it’s the Optimizer Report. And if you’ve never gone into Setup, typed in "Optimizer" and found it, this is a great admin housecleaning report. It’s going to check 45 different signals of how your org is configured. It’s going to tell you if you’re approaching any limits, it’ll tell you, "I’ve got work-low rules that are inactive, I’ve got custom profiles that have never been assigned to users." It’s really interesting information back there, you should really run that. The nugget that I really like out of the report is the Field Usage Analysis. And what it does is it looks at every object and all your fields and it tells you, "Over the last 90 days, these fields have been used less than 10% of the time." Right? And we know what happens. It’s really easy to come out of a meeting, get excited, go throw eight fields in the opportunity and four years later nobody knows what they’re for. That never happens, right? Well, this is gonna let you have data-driven decisions on, as we move to Lightning page layouts, there might be some fields you want to get rid of, right? So that’s a good way to kinda go back to leadership and say, "We need to abandon these." 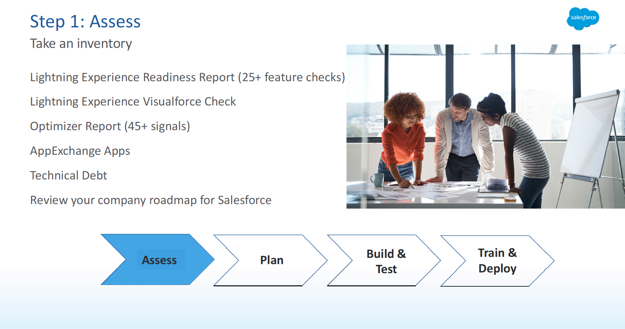 The last thing I would say in that assessment inventory stage is you need to look at your road map as a company for Salesforce. And what I mean by that is, if you think that you’re gonna go to Lightning next year, don’t buy an AppExchange app today that’s not Lightning compatible, right? 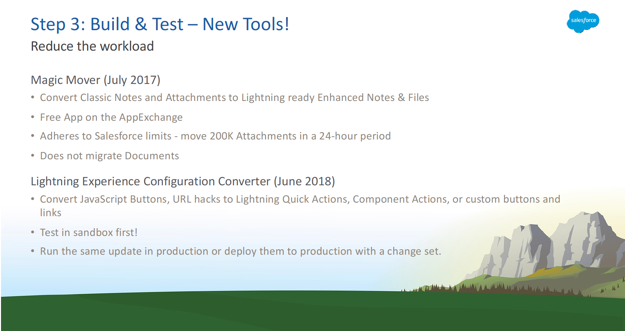 If you’ve got developers that are cruising away, making Visualforce pages, make sure that from here on out that they are testing it in Classic as well as Lightning. Don’t keep heaving onto the technical debt, right? Knowing that this was coming, look at your road map and say, "Okay, if this is what we’re going to do, let’s not make the problem worse." Everybody follow me with that? Yep, makes sense? So, this is our inventory. The output of this should be just a big laundry list, unorganized, a big laundry list of what we know about our org. I’ve got a Pro Tip for you. When you run that Lightning assessment, go into a sandbox and uninstall any AppExchange app you no longer need, maybe you put a survey tool out there four years ago for marketing and then you never sent out another survey, uninstall it. 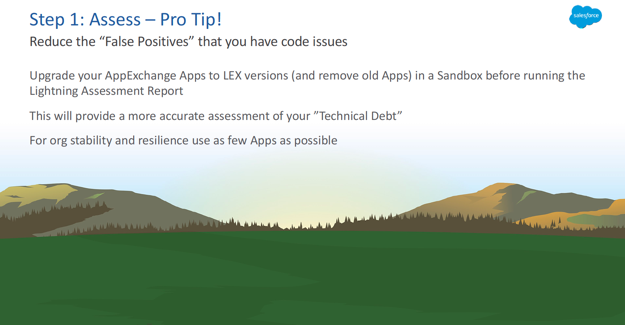 And then also in that sandbox, upgrade all your apps to Lightning-ready versions then re-run that assessment. Because what that assessment’s gonna do is give you all these false positives that you have all these code issues. And I will tell you, the majority of those code issues are probably because you have an out-of-date app that’s got bad code. And that code is gonna get flagged. This is where you get false positives. So, clean that up first then re-run it. Other Pro Tip I would say is, if you got a bunch of old apps out there that you’re not using, uninstall them out of production. 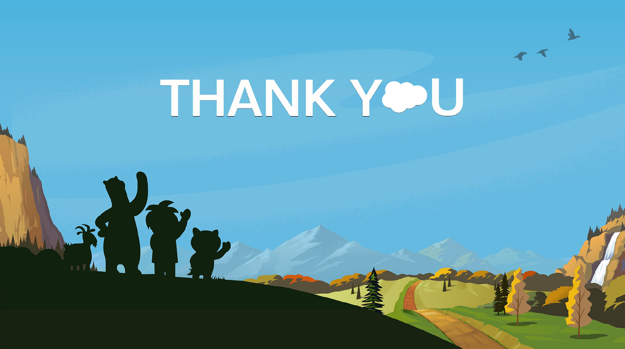 True story – a customer in Colorado had 20 AppExchange apps, the majority of them were focused on the opportunity. They had so much custom code fighting from all these providers, they could not save an opportunity. Even the system admin. Their org was locked up, they could not save an opportunity because all the custom code was fighting. So, if you want org stability and resilience, you want to have as few third-party apps as possible. Apps are great, don’t get me wrong, but do some housecleaning. Does that make sense? All right. So, we now have our inventory, right? This big laundry list of stuff. Now we have to organize it and try to figure out how we’re going to put this into work for our group. The first thing I would say is, you want to look at all your objects – standard objects and custom objects, and try to determine how many of those really merit a full-blown, full-custom Lightning page layout? It’s probably going to be an 80/20 rule. You know, 20% of the objects are where 80% of the time’s being spent by those users. That’s probably where you want to spend the time. Maybe you want to do some quick actions, maybe there’s a Lightning component, maybe you want to have a process highlighted by a path, whatever it might be. All those other objects, a lot of those related lists that we don’t see or touch for weeks on time, all these supporting cast of characters, or secondary and tertiary objects, you probably want to come up with a very standard Lightning layout and just apply it to all those. From a usability standpoint, from a user adoption standpoint, if you have 50 objects and 50 page layouts and all of them are custom, your users are going to get frustrated because every time they land on a new object they’re going to have this new page layout that they’ve gotta figure out. So, you do want some consistency with a standard Lightning layout. But then when you have these high touch, high value objects that merit it, absolutely put some sizzle in there and have a custom layout. Make sense? You’re going to have to stack rank those, really, and say, "Okay, this is where we’re gonna do some work, and these are gonna be standard." So, that helps you with the page layouts. The next thing is, are we going to big-bang? Meaning all our users are going to go live at the same time, or are we going to do a staggered phased deployment? And what I mean by that is, maybe these two groups of users can go live now, these next two groups of users will be going in six months, and so on. The way you determine that, the quick rule of thumb is you wanna "green-light" those users by three dimensions. First, is all the functionality that they have in Classic available in Lightning? If so, green light. Any apps that they’re using, is there a Lightning-ready version of that? If so, green light. Is there any custom code that they’re leveraging that we’re going to have to address? If you can green-light a functional group across those three dimensions, they can go live quick, you know, not too bad. But if there’s a dependency there, maybe there are Lightning apps not available, maybe the Lightning feature is not available for two more releases, or maybe your developers just can’t get through that custom code for another four months. That’s gonna tell you when you’re gonna put that on your deployment schedule. I think we got that pretty good. Does that make sense? When we were working with our clients, as you find issues with our org, you need to have some way to kind of go through all the things, your findings, and have a discussion about that. Like how are we gonna tackle these Visualforce pages? Here’s an example. We usually put a discussion document together for our clients. So you can say, "Okay, we’ve got a dozen or so Visualforce pages, how many of those are we gonna refactor or recode? Maybe we can retire some, because there’s some Lightning functionality that makes sense. There’s some other, quick actions, how we’re gonna handle our links, our URLs, our custom buttons. And maybe there’s some page layouts that we want to do some custom work on. Maybe we want to make a Lightning component, or our global action." This is how we make recommendations to our customers on, when we come out of the inventory and we’re trying to decide how we’re going to tackle, how we’ll fix, how we’ll address these deficiencies – this is one of the ways we organize that information. All right. So planning is done. Now we’ve got to do the work. So, your build sprints, you could have multiple sprints, you could do a big-bang, right? We’re going to do all our configuration, we’re going to do our custom code, we’re going to update our apps, we’re going to migrate our notes and attachments, we’re going to train our users. Whatever that cascade is of dependencies that you’ve got to work through, if it’s a big-bang you’re going to do all those once. If you’re rolling out in waves, you’re going to do that same kind of cascade of activities in multiple waves, right? So we going to do your configuration. Our analytics, so our reports, our dashboards we have to go touch. Our communication templates, we’ve got to touch. AppExchange apps, we have to update. Notes and attachments, I’m gonna talk about in the next slide, but notes and attachments are not compatible with Lightning, we have to address those. Custom code, again, are we have to replace it with a native new feature? Are we going to refactor and recode it? Or maybe we want to replace it with a Lightning component. Sandbox UAT. UAT is User Acceptance Testing. What you want to do is, if you’ve got groups of users that are going to go live, you want them to go into your sandbox, have them go through their day-in-the-life use cases to make sure they can do their job end-to-end without flipping back to Classic, right? That’s the goal. You want them to go in there and sign off and make sure you’ve got all those use cases of how they work and operate covered. And with that, I think we’re going to get into tools. We promised you tools, we got new tools to help you with the build phase. The first one is Magic Mover. Magic Mover came out July, 2017. It’ll take Classic notes and attachments and it will convert them into Lightning-ready enhanced notes and files. Something to keep in mind, that this utility that Salesforce has put out, which is great, it adheres to Salesforce API limits. You can only do about 200,000 attachments in a 24-hour period and then you have to wait. So, if you’ve got a million attachments, it’s going to take you five days, so plan accordingly. It does not migrate documents. If you have documents or maybe some static resources for, say, an email template, you’re going to have to move those manually. If you are in Professional Edition, you have no way to move those results from a sandbox, there’s no change sets with the Professional Edition, you can’t move that into production so you’re going to have to rerun that utility in production. If you’re an Enterprise Edition client and you have a choice – you can either rerun it in production or you can move those changes from that utility in a change set into production, your choice. All right, I feel like we’re cruising through this. So, the last step is training and deployment. 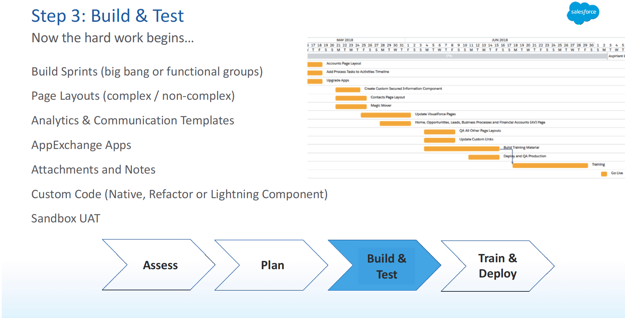 I’ve got a slide coming up about user training, but the thought is, is you want to probably go in a sandbox where you have Lightning all ready to go. Train your users there, don’t train them in production because it’s live, they’re going to affect your data, right? You don’t want them winning opportunities and making the management all excited when they haven’t won an opportunity. Then you’ve going to move that work, if you’re an Enterprise Edition client you can move that work through a change set, if you are a Professional Edition org, you’re going to have to create this work in production. You can’t move changes from a sandbox. You can test out your solutions of how you’re gonna tackle that, but you’re gonna have to recreate that work again. I’ve got smoke tests, or a sniff test. So, before you enable those profiles, you want to go log in as probably one of those users and go through those use cases again one more time, just to make sure you haven’t forgot something in one of those change sets. It’s really easy to forget something if you’re not keeping a good inventory of what goes in those change sets, that’s never happened. So just run through it one more time, and then turn them live. And from a stabilization standpoint, from post go-live support, a Chatter group is always great so people can ask questions and maybe people can see the same question come up and not have to ask it again. The other thing is to create some office hours. So maybe at noon, an hour each day for five days, you have a conference call bridge, or a GoTo Meeting, or WebEx, where people can come in and get some one-to-one help if they’re stuck. Let me spend one slide on training. 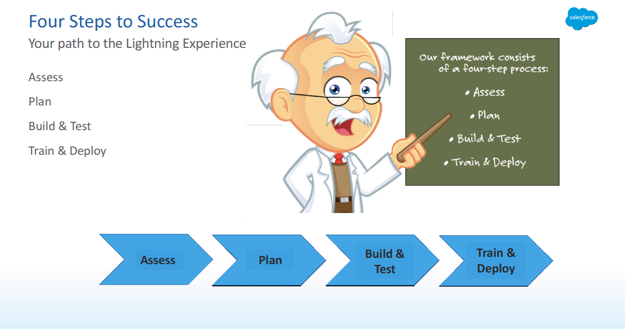 The thing to remember about Lightning training is, this is not new user training. What I mean by that is, they already know what the difference is between a lead and an opportunity is, right? They know when they’re supposed to convert a lead, they know when to submit a record for approval process. They know their job. What they really want to know is "where did it go," right? Because we’re going to rock their world and give them this whole new user interface, and that’s where they get the anxiety, and so they don’t know where this is, right? So, you want to go through those use cases of how do they do their job in the Lightning Experience, and just show them it’s all there, right? 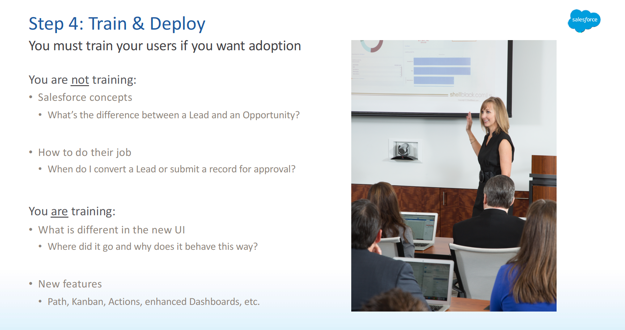 The other thing is you have an opportunity to drive some excitement and some adoption during that user training and show them all the cool features that they don’t have in Classic. Like these great dashboards, paths, Kanban boards, global actions, maybe a component, you know, you need to put some sizzle on the steak and make sure they get really excited about this transition. All right. We promised you tools, we have more tools. So, Salesforce has a Lightning Usage App, came out Summer ’18, so very recently. This is in your org already, you don’t even have to download it. 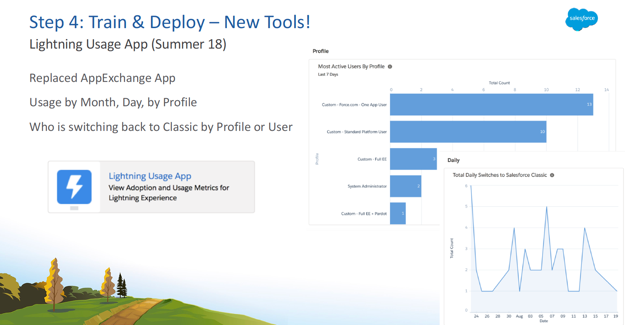 This used to be a stand-alone AppExchange app, this is now in your org, so you can go find it. This is how you can tattle and bust your users when they’re going back to Classic. And it’ll get down by profile, it’ll actually go down to the user level and tell you how many times and on what day they’re switching back. It may not be a bad idea just to go ask them, "What’s going on?" "Is there something we missed?" Right? Well, this is the way you can see that, when you’re trying to tell leadership this is good thing, if they’re actually staying in the tool. Make sense? Feel like we’re flying. So the question I always get is, "How long will this take?" And as a consultant, I must tell you. It depends. If you’re a Professional User org and you’ve got a dozen users in the sales cloud and your admin knows what they’re doing, it could take a matter of weeks, in under 30 days and you’re live. If you’re a large enterprise customer and you have a very wide footprint, it could take over a year. There was a session two years ago that I attended that was put on by Dell. 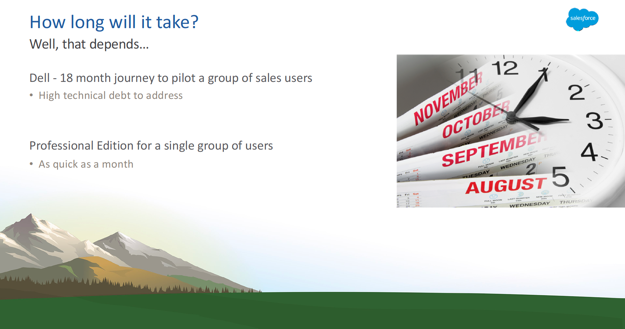 And they said that to get to a pilot group of sales users, it was gonna take them 18 months. And that’s because all the technical debt Dell had accumulated over the years, they were doing a lot of work on Sales Cloud. So, 18 months. And that’s an extreme example, right? But it can be very significant if you have a very large footprint as an organization. So, how many of you are admins, System Administrators in this room? What do you think, 60%, 70% was the quick show-of-hands? I would say the biggest thing holding you back going to Lightning is you. The biggest thing, the biggest hurdle to transition to Lightning more specifically, admin knowledge. So, in a short three years, we’ve had 10 releases. And in those releases, we’ve had 5,119 pages of release notes – 5,119 pages of release notes – start reading! If you’re a system administrator and you’ve been in denial, "Blah, blah, blah, it’s not happening, Classic is gonna survive." You got a lot of catching up to do. A week’s worth of webinars and release videos. So, how do you tackle that? Because admin knowledge is really, how do you unlock the power of Lightning is really up to you. The best path, kind of pun intended, is as Trailhead. I would look at two super badges, and super badges are pretty tough, it’s gonna take you a while to get through these. 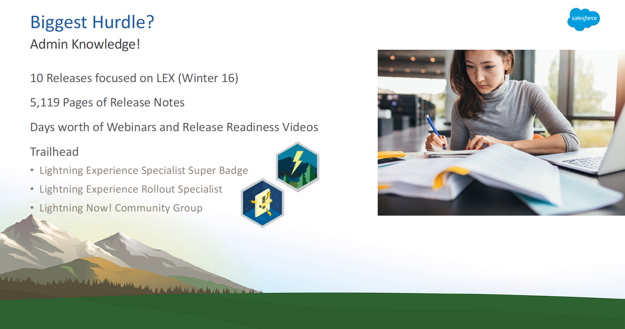 There’s a Lightning Experience Specialist super badge, there’s a Lightning Experience Roll-Out Specialist super badge. All our consultants get those badges, they’re just essential. There’s also a community group on the success community, I guess now the trailhead community, or trailblazer community. It’s called, "Lightning Now!" with an exclamation point. And in that group, it’s kind of birds of a feather, it’s other companies like you that are trying to share tips and tricks and ask questions like, "Oh my gosh, how do I handle this? And how are people solving for X?" That’s a good public resource that you can go to to get help about migrating to Lightning. If you still need help, we wrote an e-book two years ago and we just put it in our second edition for the winter ’19, so it’s up-to-date as of the last release. 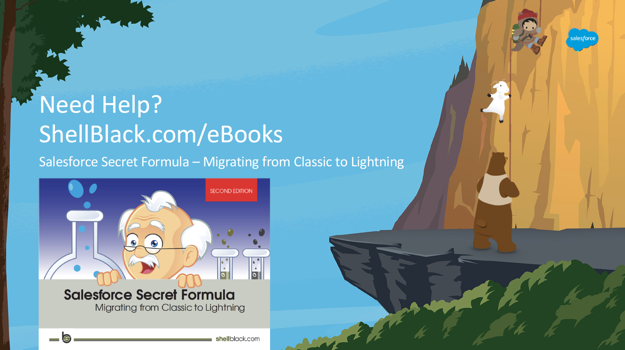 It’s called, "The Salesforce Secret Formula: Migrating From Classic to Lightning." It’s about 20 pages. I’ve got flyers here, there’s flyers at the back. So, you don’t have to remember the URL, stick this in your bag. When you get home from Dreamforce and you unpack then you go, "Oh yeah, free e-book." So, go download that free e-book from us, it’s at shellblack.com/ebooks. This is a good resource as well.